This guide is for the Nintendo DS game. For the similarly-titled PC expansion pack, see The Sims 2: Apartment Life. 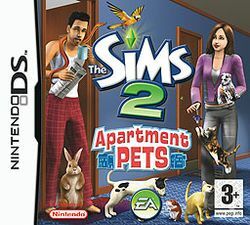 The Sims 2: Apartment Pets is a game for the Nintendo DS in the popular The Sims series. In it you'll be caring for the most pet-friendly apartment in your sims town. Pets you'll be caring for include cats, dogs, snakes, birds, hamsters and rabbits. Use the best of Nintendo DS features including the stylus and the microphone to play fun mini-games such as snake-charming. Experience the best of apartments and pets. This page was last edited on 24 October 2009, at 19:55.